The awd variants of the XF and XJ (shown) will be produced at Jaguar's factory in Castle Bromwich, England, starting in October. Jaguar will sell all-wheel-drive versions of its XF and XJ luxury sedans in Europe starting early next year, the company has announced. It’s the first time that the British marque has offered the option since it stopped making the smaller X-Type sedan and wagon in 2008. The move marks another step by the Tata Motors-owned brand’s bid to make itself more competitive against better-selling German premium rivals, which all offer awd variants. 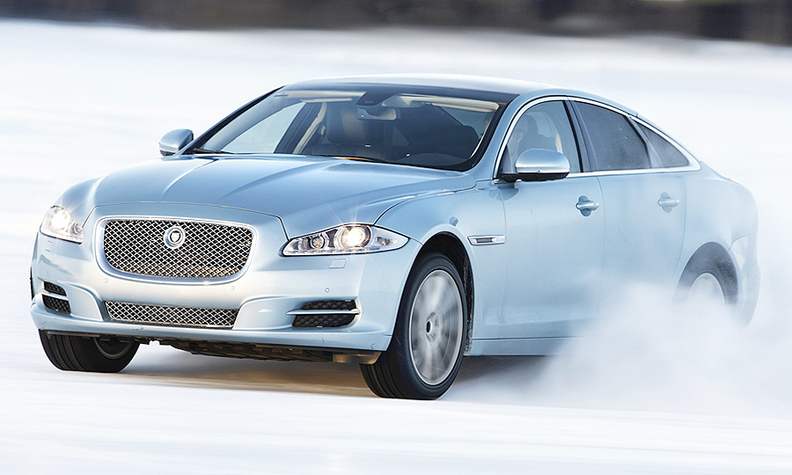 Jaguar’s awd system will be sold with the 3.0-liter six-cylinder supercharged 340-hp gasoline engine for both the XF and XJ and will cost an additional $3,000 (2,430 euros) in the United States when the 2013 versions of the cars debut there. No European price for the awd system was given. The awd system initially will not be mated with Jaguar’s diesel powertrain, but the brand wasn’t ruling it out in the future, a Jaguar spokesperson said. David Pryor, brand vice president of Jaguar North America, said the United States will be the brand’s primary market for awd and is expected to account for 80 percent of worldwide production of the drivetrain. "It is so critical for our success here," Pryor said. Russia will be another important market as Jaguar predicts awd cars will account for 70 percent of XF and XJ sales there. The cars also will go to China, but awd variants of the XF and XJ won’t be sold in Jaguar’s home market of the UK. “The new awd products are another example of how we are ... targeting specific market opportunities by addressing specific regional requirements.” Adrian Hallmark, global brand director for Jaguar, said in a statement. The diesel-only Sportbrake wagon version of the XF also joins the 2013 model year lineup in Europe, but it won’t be sold in the United States. For China and United States, the new XF range gains a 2.0-liter four-cylinder turbocharged gasoline engine. In those markets the XF and XJ also will be available with a 3.0-liter supercharged six-cylinder unit for the first time. Currently, Jaguar only offers a 5.0-liter V-8 in the three models it sells in the United States. Jaguar will unveil its new sports car offering, the two-seat F-Type convertible, at the Paris auto show in September. That car goes on sale across all markets in early 2013. In Europe, Jaguar sold 12,673 cars for the first six months of this year, a 9 percent increase. Over the same period, European premium sales leader Audi sold 383,476 cars. Jaguar developed the awd transmission with Germany’s ZF Friedrichshafen. Magna International is supplying the transfer case and Dana is the supplier for the front differential. Drive power is to the rear until information from a range of sensors decide that awd is needed to prevent wheel slip, when an active coupling is electronically engaged to provide up to 50 percent of torque up front. The awd models will be produced at Jaguar’s factory in Castle Bromwich, England, starting in October.